Residents at a 700-unit rent-stabilized complex in the Brownsville section of Brooklyn have expressed concern over their landlord’s plan to install facial recognition technology at the building’s entrance. Tenants at Atlantic Plaza Towers filed an objection with the state’s Homes and Community Renewal (HCR) agency, which oversees rent-regulated properties, in January, after learning that Nelson Management, their landlord, was seeking state approval to install StoneLock, a facial recognition system, Gothamist reports. Tenants and housing rights attorneys have expressed concerns over the far-reaching possibilities involved in this new method of digital surveillance. 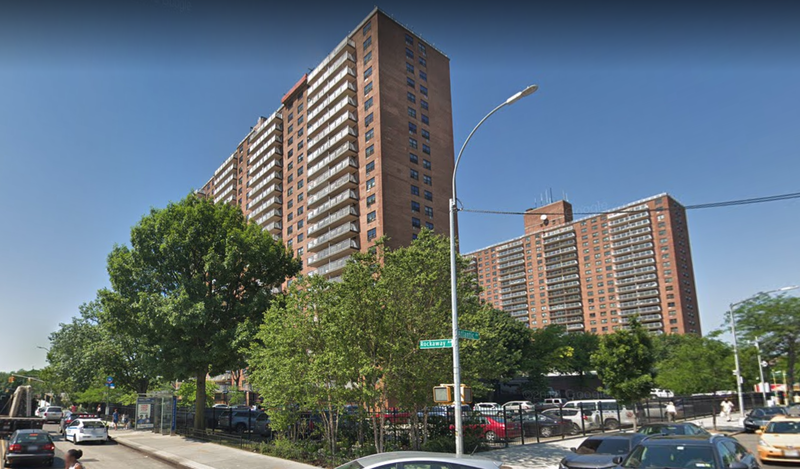 State rules say landlords of rent-regulated apartments built before 1974 need permission from HCR before undertaking any “modification in service.” Tenants at the Brooklyn complex at 249 Thomas S. Boyland Street and 216 Rockaway Avenue began getting notices about the system last fall. They fear the information collected could have potential for privacy and civil liberties violations. HCR has yet to respond to the tenants’ objection filing, which includes complaints that they were not notified about the landlord’s application promptly enough to properly file. Kansas-based company StoneLock offers an entry system that collects biometric data based on facial features. New technologies have been raising concerns about data collection methods and ethics. Latch, a keyless entry device that includes an app that tenants can use to access their apartments, is in use in over 1,000 New York City buildings. A group of senior loft tenants sued their landlord last year in housing court for installing the system in common vestibule, citing, among other things, age discrimination that may be inherent in tech-reliant entry methods as well as privacy concerns. A Latch spokesman said the tenants also had the option to use key cards supported by the software, and that the company does not collect GPS data or share users’ personal information with third parties for marketing purposes. Landlords have been moving toward keyless entry systems throughout the city, with the stated goal of convenience and enhanced security. HCR has ruled in favor of such systems in response to tenant appeals–including key fob and card entry systems–in the past, saying the updated systems don’t violate rent-regulation laws. At the Brownsville complex, though, surveillance has been an ongoing concern among tenants. After Nelson, who purchased Atlantic Plaza Towers in 2007, installed security cameras in the two buildings, tenants say the landlord has used them to monitor packages being brought into the building and has sent emails citing specific packages. “These tactics feel very much like harassment,” said Mona Patel, an attorney for Brooklyn Legal Services’ Tenants Rights Coalition which is representing the tenants. The apartment buildings are home to mostly black residents, many of whom are senior women. Seth Hoy, a spokesman for Legal Services New York, has said that their organization has handled nearly 100 eviction cases against Nelson Management and that the information about the StoneLock system was brought to their attention by a client who faces eviction. The management company has reached out to tenants to allay their concerns about StoneLock, but tenants still feel they are being asked to agree to a technology that had isn’t well-researched. The facial recognition system requires that residents submit to an initial scan; there is concern that they won’t be able to access their apartments if they refuse.